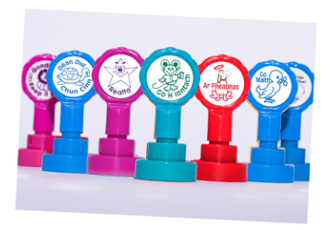 Our self inking stamps make marking a breeze! Sign up to our newsletter if you would like to receive an email of the latest news and offers from Teacher Rubber Stamps. We will send about four newsletters a year and will never share your email address. Make an impression with our self-inking stamps. Easy to use and convenient, just press down to stamp. These super little stamps will make hundreds of impressions before you need to refill them (re-inkers are available). What an easy way to mark your papers! Such fun too - why not collect all of them? Copyright © 2019 Blade Rubber Stamps Ltd. All Rights reserved.